Ireland: Dublin – Getting to Know the Capital of the Emerald Isle. 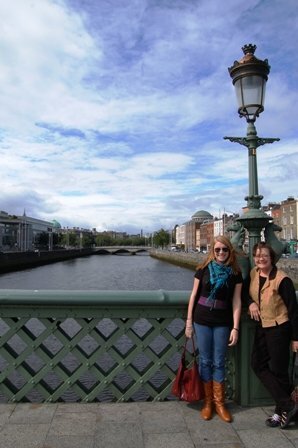 My daughter Jule and I are all smiles by the Liffey in Dublin. It’s Sunday – my first day in Dublin on my own. I have my Lonely Planet (guidebook), my city map, and I just purchased a ticket to the hop-on-hop-off tour. 23 stops in total- sounds excessive but how else am I going to get the lay of the land? As I stand at the starting point or should I say one of the starting points a large Viking ship shaped bus drives past me full of screaming laughing tourists wearing viking hats. Yet another way to see this historical city. I had often been told no trip to Ireland is complete with seeing the bustling capital, Dublin. What I discovered was that whether you have days to explore or just an afternoon, Dublin has something for everyone. For those with limited time in Dublin, you might want to try the city’s Hop-On Hop- Off tour, which I choose to do. It is a fun way to see the sights of the city and the easiest way to explore then. Stops include the old Jameson Distillery, the Guinness Storehouse, the Kilmainham Gaol (the old jail which not only has great historical importance in Irish history but has also been featured in many films), St. Patrick’s Cathedral, Phoenix Park, Dublin Zoo, and more. The bus makes 23 stops in total with live commentary the whole way. For 15 euro (13 for students, 6 for children) you get a 24 hour ticket and can get on and off at as many sights and stops as your heart desires. The bus comes about every 15 minutes so even if you just want a quick picture or to stretch your legs, its ideal. It you have more time to spare, pack a picnic lunch and head over to St. Stephen’s Green, a beautiful fenced park in the city center. On Friday afternoon’s there is even live music. It is normally crowded around lunch time so if peace and quiet is more what you are after you can walk a little ways to Merrion Square, a smaller fenced park (once a private park for the wealthy), lined by beautiful Georgian houses and featuring a colorful statue of playwright Oscar Wilde. This particular park and statue was one of my favorite places in the whole city. The statue which directly faces the old childhood home of Oscar Wilde, which now houses the Irish-American University. Both of these are with in walking distance of Grafton Street, the most popular shopping street in Dublin. This street is always bustling with locals, tourists and street performers. If you are feeling hungry you should have tea or lunch at one of my favorite spots, Bewley’s Cafe, right in the center of Grafton Street. It has a long standing history in Dublin and is local favorite. Another place that is not to be missed, not far from St. Stephen’s Green on Wexford Street, is Hell Pizza Kitchen (a New Zealand owned chain). They specialize in gourmet pizzas for a reasonable price, not to mention the fun themed atmosphere. For more shopping you can check out Henry Street just off of O’Connell Street, where you can visit the Old Post Office which was the headquarters of the 1916 Rebellion which led to Ireland’s independence. You can also enjoy the afternoon in Phoenix Park, Europe’s largest enclosed park, which houses the President’s house, the American Embassy and the Dublin Zoo. It measures over 1,760 acres so you will have plenty to explore. You can rent bikes through the new city wide insinuative, Dublinbikes. Bikes can be rented from over 40 stations, where you can purchase your Three-day tickets. Other fun things to do include visiting Trinity College to see the Book of Kells, a elaborate copy of the four Gospels dating back to 800 A.D, and the Old Library, which is as beautiful as it is impressive; Dvblina, the viking experience and museum; Dublin Castle; The National Gallery and The National Museum of Ireland (both which offer free admission); Science Gallery (great for kids and free admission) and the Dublin Writer’s Museum. Temple Bar, the cobbled street section of town including many great pubs and night spots and shops, is a must see for all visitors to Dublin, however those with smaller children should steer clear of the area at night as it is full of pubs and many times rambunctious with Stag and Hen parties (Bachelor and Bachelorette parties). You are in Ireland, remember. 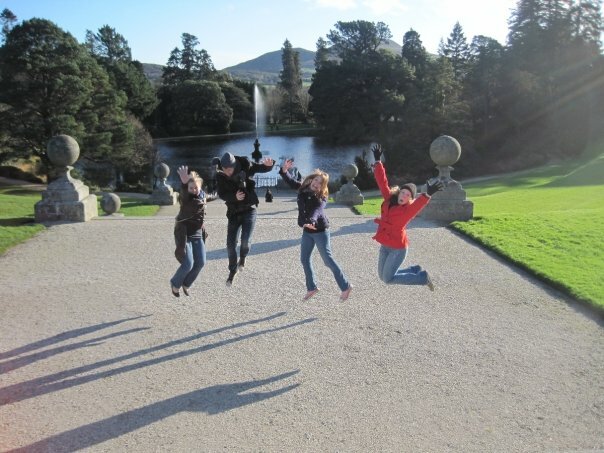 Dublin is so much fun it (literally) makes you jump for joy. If you are a theatre buff you should catch a show at the famous Abbey Theatre or sojourn to the Smock Alley Theatre in Temple Bar, which was originally built in 1662 as the Theatre Royal of Dublin. Over the years the building has served as a church and a school but it now houses the National Theatre School of Ireland. It is a sort of theatre mecca for anyone who loves English Theatre as many famous British( and Irish )actors have performed there in the theatre’s long history. Insider Tip: Dublin is a fun vibrant city with very friendly locals. You shouldn’t be afraid to ask directions, however, be forewarned that the Irish are infamous for the inability to clear directions. On my more than on occasion I received directions that sounded something like this ” Do ye know O’Connell St.? Well, its no where near that…” and other funny phrases like that. For the most part, you are bound to met some wonderful people and come back with some hilarious stories. The best advice I can give is know your way to your hotel from either O’Connell or Grafton Street, because any local will know those places as will any cab driver. It will save you lots of headaches in the long run. Getting from the airport: You can take a taxi but if you are looking to budget you can take the Airlink or Aircoach bus both which leave every 10 minutes and costs under 10 euro and will take you to O’Connell Street as well as other prominent stops.